While our TrustBox widgets are designed for websites, they work just as well in mobile apps. This article walks you through how to implement a TrustBox in your mobile app. Developers, you can go straight to our GitHub project for basic code examples and iOS or Android instructions. Because our TrustBoxes are designed for the web, implementation for native apps involves copy/pasting an HTML <script> tag that loads the TrustBox functionality and a <div> tag that defines the parameters of the specific TrustBox. 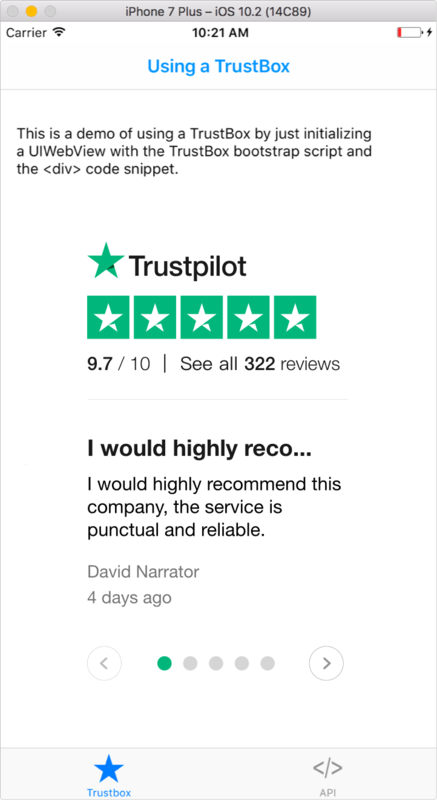 You can find all of our TrustBoxes in Trustpilot Business under Integrations > TrustBox Library. A TrustBox can be used to show Trustpilot data in your app by using the WKWebView from the iOS WebKit SDK. Ask your developer to follow the implementation steps provided in our GitHub project. There are also more tips, e.g., how to handle navigation from links in the TrustBox. A TrustBox can be used to show Trustpilot data in your app by using the WebView from the WebKit SDK. Ask your developer to follow the implementation steps provided in our GitHub project. 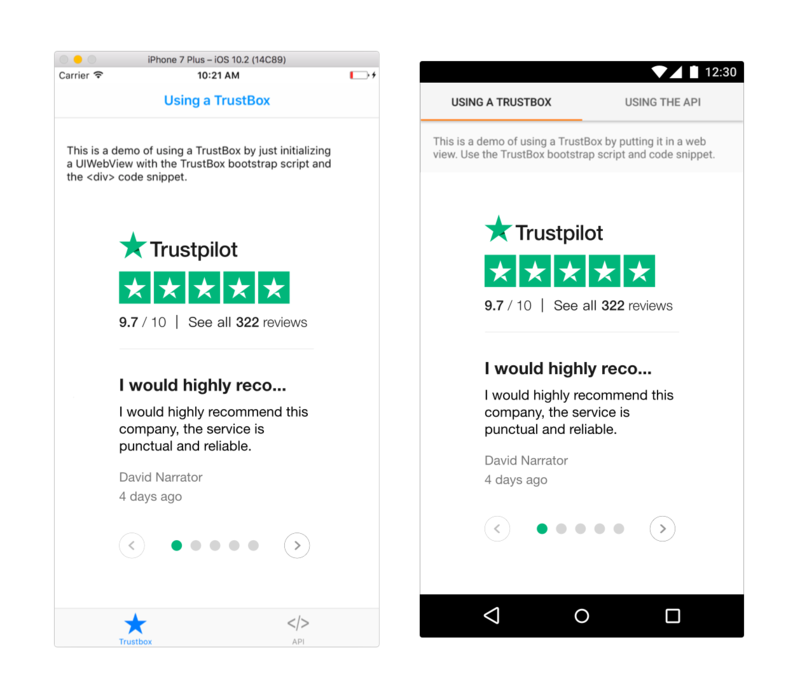 You can use Trustpilot’s APIs to build custom versions of our TrustBoxes. 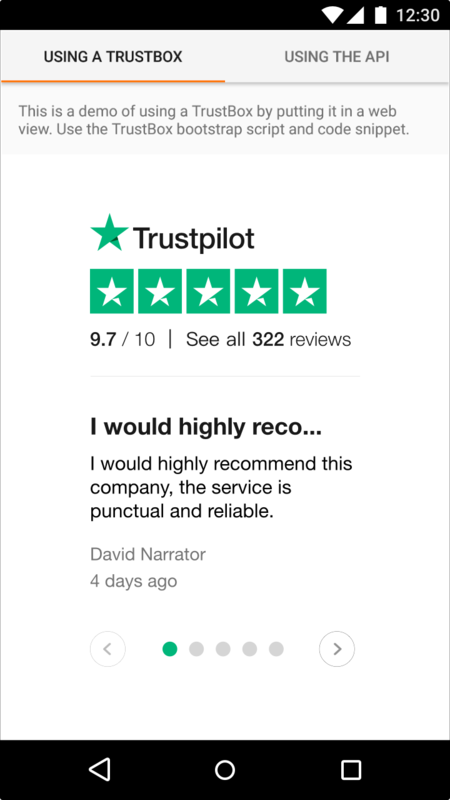 Through our APIs, you can get data about your company on Trustpilot, e.g., your reviews, TrustScore, number of reviews, and current star rating. To use our APIs, you need an API key, which you can get from your account manager. 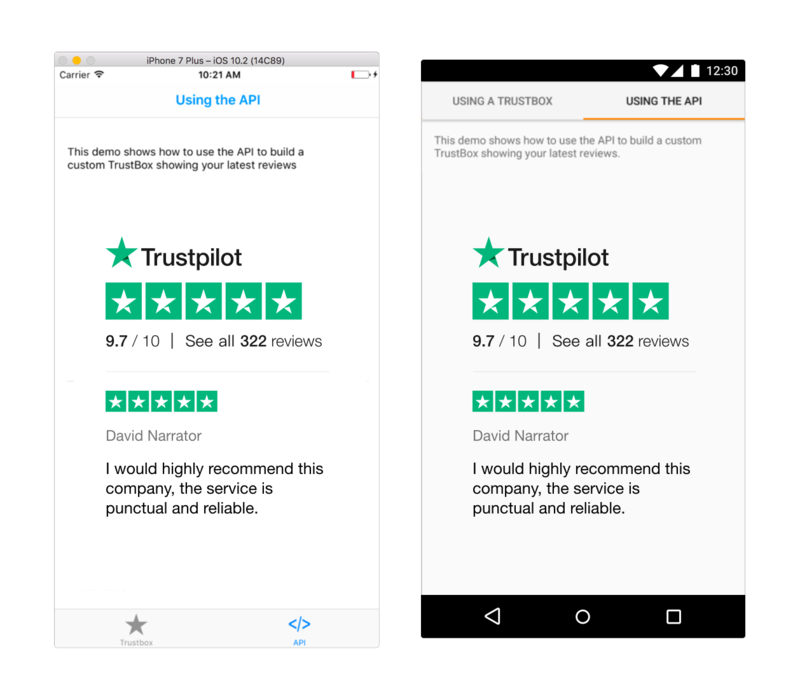 In our GitHub project, there’s an example of how to use Trustpilot’s APIs to show reviews in your mobile app. Learn more about getting started with our APIs and see our API documentation for developers.